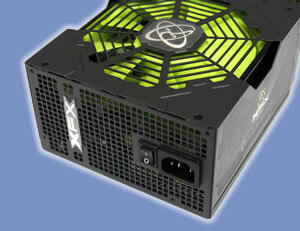 If you can excuse the slightly distasteful pun, XFX have entered the PSU market with a bang! During the traditional load tests the unit performed excellently, managing between 88-90% efficiency with extremely tight voltage regulation that stayed below 1% fluctuation on the +3.3v and +5v rails, and only hit 1.31% fluctuation on the +12v rail. Simply excellent. Add to this the low output temperatures and silent operation and the XFX Black Edition has all the ingredients to be a worthy competitor of Corsairs HX850w unit. Attention has also been paid to the appearance of the unit, with some highly unique styling that has transformed what could have been a standard oblong box into something you’d expect to see on the set of an alien sci-fi movie. The lime green accents such as the fan, modular connectors and logo stickers absolutely scream XFX, and when combined with a pair of similar styled Black Edition graphics cards will undoubtedly look the part. However, I can’t help but think that XFX could have been a little more creative with the modular cables, which have been treated to just the usual black sleeving affair. On the other hand this could be the saving grace for people who want to complete an XFX trilogy inside their PC without overdosing on citrus. Right about now I’d probably be contemplating an award such as Editors Choice or maybe Gamers Choice and an almost full-bars score. But unfortunately as I’ve already covered on the previous page, the XFX Black Edition 850w does have a a tendency to go ‘pop’ under certain load conditions. These conditions were of course outside specification during the "Max Load" tests where the unit was placed under a load approaching 1000W, but under no circumstances should a PSU of this quality fail in this manner simply because the load is too high. OCP (Over Current Protection) should kick in every time, saving both the PSU from failure and your hardware from being 'zapped'. For this reason alone the Black Edition 850w won't be walking away with any awards today, which is a great shame considering how well it performed in all other areas. Any feedback from XFX will of course be posted at the end of this review. - Borderline 80PLUS Gold level efficiency. - Silent operation at loads of up to 750-800w. - Rock solid voltages across all rails in standard tests (1-4). - Efficiency drop to 82% in cross-load test 5. - Out of spec -12v output in cross-load test 6. - OCP failed to power off unit in max-load test 7 before it died with a bang.